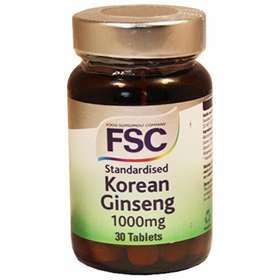 FSC Korean Ginseng 1000mg Tablets 30 is taken daily to improve mental and physical performance and fortify the immune system to protect the body against environmental stressors. Its properties have varied benefits; from enhancing memory, improving cognitive ability, promoting better focus and concentration, helping in easing insomnia and anxiety. enhance physical performance, increase sexual potency, stabilise blood pressure, improve blood circulation and prevent heart disease. Korean ginseng is often incorporated in numerous multivitamins because its ability to counter the effects of stresses on the body. Women have found benefit from relief from hot flushes and painful anxiety of menopause, and studies have indicated that it increases ovarian oestrogen production during early menopause. It also helps to enhances the breakdown of alcohol in the body and suggests it may shorten the symptoms of a hangover. A health booster herbal supplement and a daily essential for the maintenance of an energetic and healthy lifestyle. Improves the daily resistance to stress. For energy and sport and the fully active. Relief from painful anxiety of menopause. Adults and children over 12 years of age; Take one tablet daily with food. Replace cap firmly after use and store in a cool dry place. Protect from light and heat.